The Washington State Department of Health is reporting that measles led to the death of a local woman. It is the first death attributed to measles in the U.S. in 12 years. The last reported measles infection that resulted in death in the U.S. was in 2003. According to the report, the woman was most likely exposed to measles at a local medical facility during a recent outbreak in Clallam County, Wash. She was at the facility at the same time as a person who later developed a rash and was contagious for measles. The woman had several other health conditions and was on medications that contributed to a suppressed immune system. The initially undetected infection was discovered at autopsy and identified as measles-related pneumonia. Even although this woman's health was compromised by illness, the fact that she was exposed to measles during an outbreak provides further support for the immunizing of as many people as possible to provide a high level of community protection. Those with compromised immune systems are especially vulnerable as they often cannot be vaccinated against communicable diseases. Even when vaccinated, they may not have a good immune response when exposed to disease; they may be especially vulnerable to disease outbreaks. Measles is highly contagious even before the rash starts, and is easily spread when an infected person breathes, coughs or sneezes. Without protection, you can contract measles by walking into a room where someone with the disease has been in the past couple of hours. 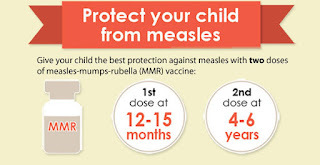 Infection Control Consulting Services supports the recommendation that everyone who is eligible for the measles, mumps, and rubella (MMR) vaccine get vaccinated so they can help protect themselves, their families and friends, and the vulnerable people in their community.